Chad Schuett grew up in a rural community in the Cariboo region of BC, has travelled the province extensively and lived and worked in most regions finding inspiration in the amazing environments around us. Having worked in many facets of forestry and construction, from sawmills and falling to building homes and custom woodwork, he has developed a huge respect for nature and our forests and has found a passion in creating beautiful things from wood. He has been living in Fernie in the scenic Elk Valley since 1997 where mountain living has been the influence of his unique pieces. 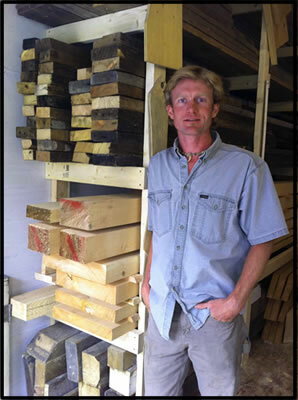 The inspiration for the name True Axe Timber Crafts comes from the town of Truax, Saskatchewan. Truax, formerly Schuett and Schuettville, was founded by Chad’s great-grandparents. His great-grandfather was a carpenter who built many of the barns, homes and the church, including possibly the first timber frame barn in southern Saskatchewan. This year in 2011, Truax celebrates its centenial as a town and True Axe celebrates its inaugural year in business!